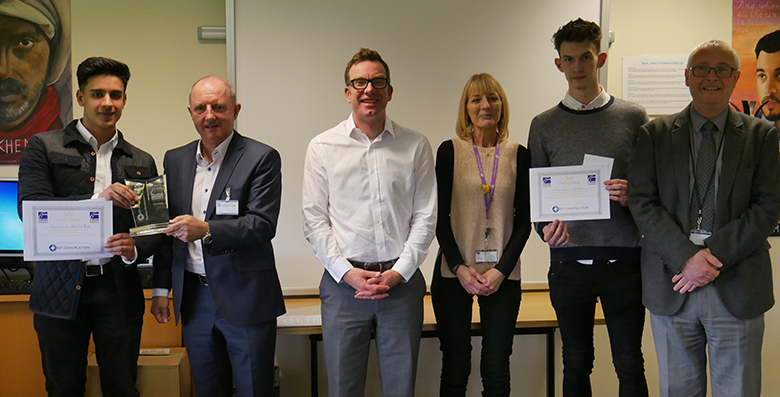 Business students at The Sixth Form College, Solihull took on a panel of dragons last week, as the annual ‘Dragons Den’ style event, sponsored by Key Construction (Midlands) Ltd and West Hart Partnership, took place. Four groups of students presented their business plans to a panel of judges, which included Bernard Callinan (Managing Director of Key Construction), Jim Hart (ex-student, now running his own architectural practice called West Hart Partnership), Margaret Harrison (Assistant Principal of the College) and Peter Brown (Procurement Manager at the College). They listened to the students deliver a 15-minute presentation of their business ideas, before firing questions at them to see how they handled cross examination. The winning presentation was delivered by students Faizal Zeenab and Nathan Egleton, who came up with a business plan for “That Food Truck”, an American-style food truck. They received gold certificates and £200 and will also be presented with a trophy at the end-of-year College Awards Evening. Second were Tanya Ellis and Bayleigh Mooney. Their business idea was Sparkz, a service that personalised footwear and other accessories. They received a £100 second place prize, along with silver certificates. In joint third place were the businesses BabyBloom and Your Sport. Babybloom was the brainchild of Jodie Randall and Isma Ramay, who were pitching to create designer organic baby clothes. Meanwhile, Your Sport was the idea of Ryan Jones and Angelo Millas, who had planned a specialised sports shop. They shared a joint third prize of £100 and were awarded bronze certificates.